On December 4-5, with a support of the joint EU/UNDP “Community Based Approach to Local Development” (CBA) Project held a visit of representatives of universities: Taras Shevchenko National University of Luhansk and Volodymyr Dahl East Ukrainian National University (SNU), and of Luhansk regional state administration to Zaporizhzhia National University (ZNU). During the Meeting, ZNU representatives introduced principles of Zaporizhzhia Centre of Sustainable Development to the visitors. 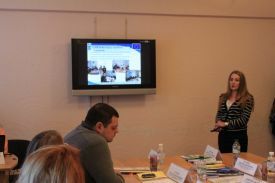 Inna Dudareva, Head of Resource Centre of Sustainable Development in ZNU, told about activities of Resource Centre of Sustainable Development in Zaporizhzhia. She mentioned that now there are eight specialized centres, and one of them is based in Zaporizhzhia National University. Thanks to a support of CBA Project, students from the faculty of Social Science are able to both: do research on sustainable development problems and do practical work in local communities of Zaporizhzhia region. Moreover, at the faculty of Social Science was implemented study course “Society sustainable development” and energy efficiency program. During the discussions, there were showcased game teaching methods in teaching disciplines of sustainable development. There were also presented the results of sociological research in the Zaporozhzhia region in the framework of the CBA Project. ZNU students also participated in the event. 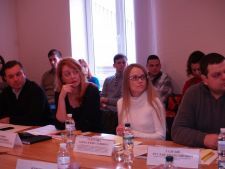 They presented results of work experience in the summer school of sustainable development, gaming technology learning and told on the use of debate technology in learning. At the end of the meeting, the delegation visited Luhansk Region Resource Centre of Sustainable Development in ZNU, and Inna Dudareva made a gift in the form of tablet for future Resource Center of Sustainable Development Luhansk region. The meeting was held in a very friendly atmosphere, the representatives of Luhansk region was inspired on their own development in the framework of the CBA Project and the creation of a resource center. "Experience in Zaporizhzhia is very impressive. Of course it is necessary to adopt and adapt to the characteristics and features of the Luhansk region, the regional project and the center"- says Ruslan Halhash representative of SNU.